Exposure to high levels of EMF is proven to contribute to sleeplessness, sleep disorders and sleep deprivation by inferring with our cell function and our brain's restorative sleep functions, leading to many serious consequences. Why so serious? The USA National Library of Medicine for the National Institute of Health website puts it this way, “Electro-biological research of sleep showed that EMF at night has more severe effects on health in comparison to EMF radiation in day time. Poor sleep quality has been associated with increased tension, irritability, depression, confusion and generally lower life satisfaction. Poor sleep quality reduces longevity from 80 years to 65–70 years, and is associated with numerous health problems (gastrointestinal disorders, depression, exacerbation of chronic disease). Extremely low electromagnetic frequencies are in the same frequency ranges as our brain waves”. Being exposed to high levels of EMF during the day is one thing, but exposure at night while we are defenseless in sleep is quite another. EMF disrupts our cell function, including our neurons, or braincells, to the point where our sleep is disrupted and unable to be restorative or rejuvenating; our sleeplessness compromises our immune system to the point where our health begins to suffer as our physical, emotional and mental processes begin to break down. This is becoming a serious concern as this EMF in our environment is scientifically proven, in study after study, to disrupt cell function and DNA repair, age us prematurely and make us ill, tired, fat, while it robs us of our quality of life and leads us to an earlier death. If that weren’t enough, it also produces consequences that reach beyond ourselves well into the future, from such things as impaired sperm and egg integrity. EMF is now referred to by such names as Electrosmog, Electromagnetic Pollution, or Wireless Smog, since it is an invisible sea of frequencies that surrounds us, and its negative effects on us are alarmingly increasing due to the rapidly escalating proliferation of cellphones and WiFi, and also of electronics, electricity and more. No mater how electronically polluted your sleeping environment, with this valuable new eBook you can block EMF from your sleep space, giving yourself a respite from relentlessly pervasive EMF and eliminating the rampant DNA cell damage it does, during the most important hours of all – your vital, regenerative sleep time. Sleep exposure to Electronic Pollution and the harm it does is so serious we felt it warranted its own entire book dedicated to helping you create your EMF -free sleep zone, in instant download ebook format to get you started right away. This popular book, by instant download ebook or hardcover, will help you enjoy a more restful and healthful sleep tonight in easy to follow, step by step instructions on eliminating and mitigating EMF from hazardous electrical and magnetic fields, as well as harmful radio frequencies from all the various types wireless communications, and radiation beaming through your bedroom walls from such invisible electrosmog as power lines, cell towers, airport radar, your neighbors WiFi and much more. Order the ebook version and receive it by instant download within minutes (complete description on order page): "Your Bedroom Sanctuary: Creating an Electrosmog Free Sleeping Environment" . Only $14.95 (155 pages includes 3 online streaming how-to videos, worksheets). Give the gift of healthful sleep for $34.95 plus $5.00 shipping and handling, (USA Orders Only - shipped by USPS). Spiral bound format - 155 information packed pages with how-to online videos and detailed user friendly DIY diagrams and worksheets. 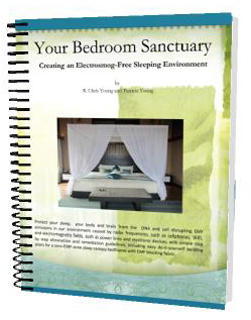 "Your Bedroom Sanctuary: Creating an Electrosmog Free Sleeping Environment"
International order? The cost of shipping is based on destination, please send us an e-mail inquiry with the shipping address to determine the amount.